After I ran the Amsterdam Marathon last year I knew I'd be running anther marathon. I didn't get the time I wanted and felt I had more potential in me. The marathon and I had unfinished business. On the advice of one of the coaches at Kent I didn't sign up for a spring marathon, focusing instead on the Reading Half Marathon. It certainly was the confidence booster that I needed and a time that I didn't think I could run. After the half marathon I let my fitness slip a bit promising myself that I'd ramp up once I got back from Africa. With the odd exception it has been seventeen weeks of really good training and I'm currently enjoying the taper. When I ran Amsterdam I was a 'one pace plodder', someone that ran all of my training runs at the same pace. Since then I've got a bit more into 'modern' training plans, doing specific speed sessions and the rest of the time running more slowly than I have done in ages. I feel fitter and stronger, but it requires a leap of faith that I'll be able to run at my target pace on race day. Back as a 'one pace plodder' I'd run 22 miles at my target pace and it wasn't hard to imagine doing the extra four miles on the day when I was well rested. This time the maximum I've done at target pace is 10 miles. It has been great to get so much advice from fellow Kent AC members and to have completed some of the toughest sessions with my running buddy Rich. It makes such a big difference to train with someone of a similar speed when you are doing the toughest workouts. My running style, and the shoes I use, has also transitioned during training and I'm now a pretty consistent forefoot striker. Something that I've been working on ever since my coaching session back in Sydney. The only major hiccup during my training has been the stomach problem which struck me down before the Maidenhead Half Marathon. The doctors still don't know what it is, and I might have to have an endoscopy after the race, but at the moment the drugs they've given me seem to be managing the situation. It's the hardest I've ever trained. Every couple of weeks I have I have boosted my mileage topping out at two weeks of sixty five miles. I've even worn out a pair of shoes in the process, the first time I'd done that. 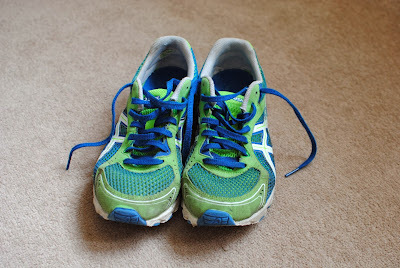 Abingdon Marathon, I'm coming to get you.